Welcome to My Book Site! This book was an adventure of exploring what happened to the Siamese Cat. It was a lure to me that was not to be denied. Especially since I am a deeply involved player in some of the events. Always an insatiable desire to know, really know the truth, causes me to seek out answers that are not always evident on the surface. Once exposed to titilating hints, I had to search for more details. I couldn’t leave the truth un-revealed. 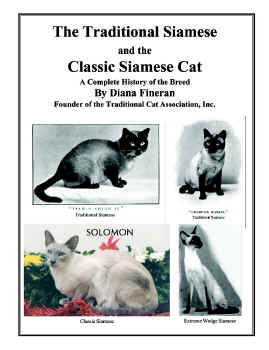 Therefore, I set out to write this book to publicly divulge in a dramatic disclosure all of the discoveries I’ve made and the personal knowledge I have concerning matters of the Siamese Cat and other breeds that were kept secret and not previously known. Several questions wandered about my mind as I began work on this book. What had happened to the Siamese cat over the decades? Who was responsible? Why was the breed so dramatically altered from its original state? What was the truth? What was the lie? For those who kept the torch of fidelity to the original, Old Style, Traditional Siamese and Classic Siamese, this book is a testament to their unwavering, trustworthy character. For those responsible for betraying the breed, working acts of questionable breeding practices and distributing untruths, half truths and out right lies, it is an irrefutable atonement for their sins. There is no way for them to make amends now for their deeds have been laid bare for all to see! My book proves all of this and more. Much similar to an archeologist on a “dig”, I meandered through history, roamed over massive amounts of reading, and poured through old books that smelled of dust and age, gleaning the satisfying resolutions to my inquiries. Like the archeologists brush, my effort was meticulous, leaving no stone un-turned. Sometimes I would read for days on some tangent trail I found only to come up dry. Then I would read one whole book to find one sentence of vital details. Picking up an antique book, with its yellowed pages and fabulous photographic record, inspired awe and reverence in me. A welling up of gratitude to those venerable authors, who preserved the Siamese Cat’s history so well was a wonderful experience. Time was the major element of my investment. Time for reading hundreds of books. Time for writing hundreds of pages. Time to sort out the facts that were to be proven. Time for finding authors, photographers and publishers. It took 11 years from start to finish and I enjoyed every moment of the intrigue. Everyone interested in cats, all those curios about the other cat associations, people desirous of knowledge about all aspects of historical record will enjoy my book. Pedigree researchers will find a wealth of ancestral records and photos. It has a considerable breadth of facts, data, photos, direct quotes and incite from a point of total honesty unparalleled in the cat world. Through research and investigation the truth is brought forth. My search drew me in, as I’m sure it will draw a reader as well. Owning my book puts all of the Traditional Siamese, Classic Siamese, and Extreme Wedge Siamese history at your finger tips in ONE PLACE! Other breeds that were based on the Siamese are included as well. This is so important because I did the “foot work” for the reader. Everything I found was scattered helter skelter in many sources and in small amounts. Never before has the full story been gathered together as a resource for reference and told, concisely, clearly and with respect. I untangled the mass of information and put it all in a single book. The shadows of long ago, and nearly lost memory have been brought back to life again. History can not be denied! The 980 pages and over 1100 photographs tell the story. Copyright 2003-2018 All Right Reserved. Tullycrine LLC.